David Hudson from the Huntingdon-based BRJ Running Club was the first man home in the annual Thorney 5 road race yesterday (August 19). 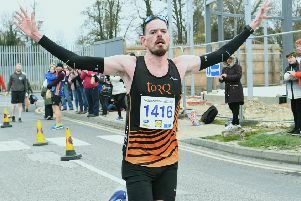 He completed the five miles in 26:16.9 with Peterborough Athletic Club’s Phil Martin the runner-up in a personal best 27:06.7. Action from yesterday's Thorney 5. Martin received good support from Nathan Popple (11th in 30:27) and Steve Hall (14th in 30:44) to earn PAC the first male team prize. First female finisher was Toni Alcaraz from March AC in 32:00.8). She was 22nd overall out of a field of over 200 runners. Lisa Marriott from Ramsey Road Runners was second in 32:23.3 and March Athletic Club’s Melissa Neal third in 33:48.4. The Fun Run winner was Thorney Running Club’s Elijah Goodwin in 11:23 closely followed by Nene Valley Harrier Chelsie Bole in 11:30. Steve Hall helped Peterborough AC to team success.